Read my latest story for The Economist in full below or by clicking this link. WHEN Sabine Hauert told a recent RE.WORK technology summit in London about injecting trillions of man-made smart devices, some as small as 10 nanometres (billionths of a metre), into the human body and programming them to work as a pack to hunt down and kill tumour cells, it seemed to be a fantastically futuristic notion. But Dr Hauert knows her stuff and is starting to turn the idea into reality. She lectures at the Bristol Robotics Laboratory in Britain and has worked closely with Sangeeta Bhatia at the Massachusetts Institute of Technology, one of the pioneers of using miniaturised biomedical tools to fight cancer. What Dr Hauert is hoping to do with these nanoparticles is to give them the same kind of eerie collective intelligence that is displayed by swarms of birds, insects or fish. Some nanoparticles are already used to deliver drugs to a specific area of the body or to gather at the site of a tumour so that it can be identified more readily and destroyed by heat or radiation. And studies have suggested that if those nanoparticles could somehow communicate, move and act as one they could deliver 40 times as much medication. One of Dr Hauert’s colleagues, Alan Winfield of the University of the West of England, which along with the University of Bristol runs the robotics lab, compares the challenge to getting robots to swarm, but without the benefit of being able to program them to do so. Nanoparticles, after all, do not contain electronics and run on software as robots do. To get robots to swarm three simple software rules are necessary: don’t get too close to another robot; return if too far away; and keep going forward. That, says Dr Winfield, will make robots swarm like midges on a summer’s evening. A fourth rule, to go only in the same direction as your neighbour, will produce behaviour similar to that of a shoal of fish or a flock of birds. But it is a fifth rule that would make the swarm useful for bioengineers. This would instruct the robots to follow, say, a light source or magnetic field applied from outside the body. The robots would then move like worker ants in the direction of the beacon. Dr Hauert says it is possible to program nanoparticles by changing their design. This might be their shape, size, coating, electrical charge or the materials they are made from. Ant-like trail formations have already been observed with some nanoparticles, adds Dr Hauert. Tinkering with the design can lead to unpredictable behaviour. But Dr Hauert has a way to crowdsource potential designs and simulate the likely outcome. This is NanoDoc, which works like an online game. It allows bioengineers, and anyone else who would like to have a go, a chance to model nanoparticles. As in most computer games, players need to earn their spurs and work through the first levels to become a master, or in this case a certified NanoDoc. Their reward is a real challenge: for example, designing a nanoparticle that can detect a rare event such as a sudden cancerous mutation. The best solutions are tested in the laboratory and, if successful, will be tried in animals and ultimately in human trials. Since its launch in September 2013, NanoDoc users have performed over 80,000 simulations. 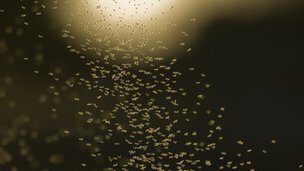 Successful designs, however, can still run into problems: what happens if some of the nanoparticles in the swarm are damaged? Would they still be controllable or could they turn toxic? The researchers have a lot of work to do, especially in getting some form of communication going between nanoparticles. Yet the research has already come far enough to persuade Dr Hauert that she could apply some of the lab’s simulation software to programming robots to swarm in the real world. That might be for tasks such as using legions of swarmbots to help clear up an oil spill or put out a wildfire.